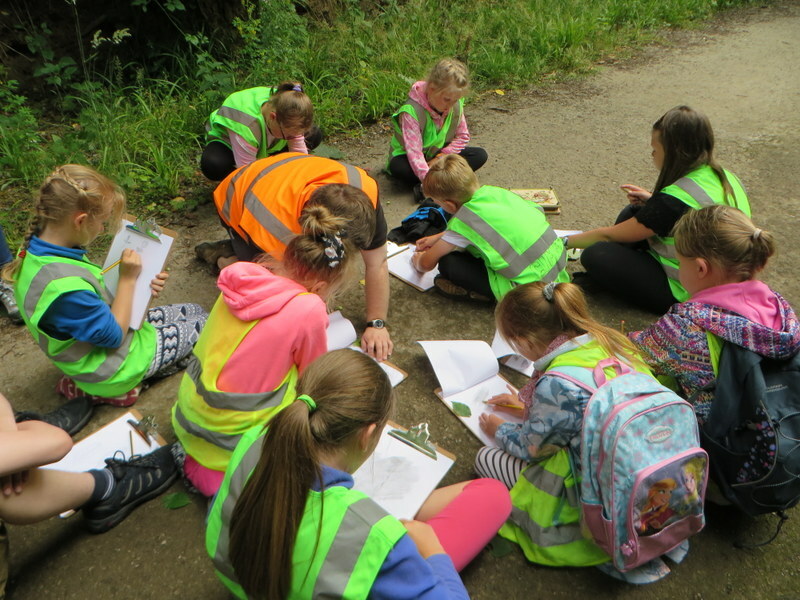 Today was based at the amazing Cleveland Ironstone Mining Museum in Skinningrove, forming part of their summer activities for eight year old children in the area. We started the day with a great game to get to know everyone’s names. It was genuinely a great game; unfortunately, however much I can remember plant names and what the plants look like, I find it really hard to remember people’s names. 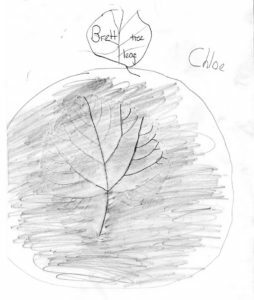 Many years ago I did comment that everyone should change their name to that of a plant but it was suggested to me very politely that the world doesn’t work that way. 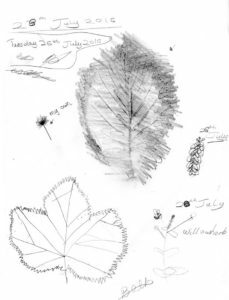 Anyway, we looked at different leaves and looked to see if they were from the same tree or a different one. There were three different maps of the same place and after much questioning and much answering, we worked out that the maps were made at different times in the past. 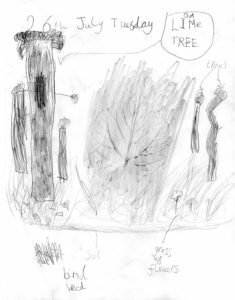 I passed round sketch books showing someone’s diary entries and drawings of the plants they had found on their walks. 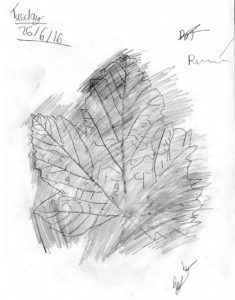 We all watched me demonstrate how to draw and we discussed how difficult drawing was, but the leaf rubbing looked easier to do. Also it turns out that I have veiny hands and a wrinkly face (full marks for observation…which is what we were doing and what I was encouraging, but I feel there’s a lesson in that for me – I retaliated by making one of the veins wiggle which was of course “gross!”). Lunch and then the traditional donning of the fluorescent waistcoat before setting off up the village road to Whitecliff Wood. 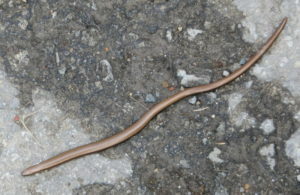 Having safely crossed the A174 one of the children spotted an awesome slow worm (actually a legless lizard – I checked – who knew?) which hung around long enough for everyone to have a look. 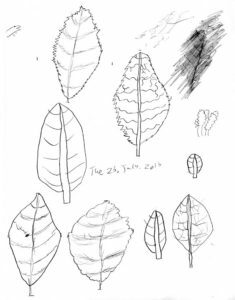 And then off past the animal sanctuary where we stopped to identify a bush that grew nuts (in the process of naming it I think we named every other possible nut that exists before getting to the right one)….followed by a bit of drawing and leaf rubbing. 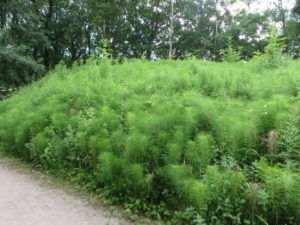 And we saw a horsetail – a plant that has spores like ferns instead of flowers like other plants. 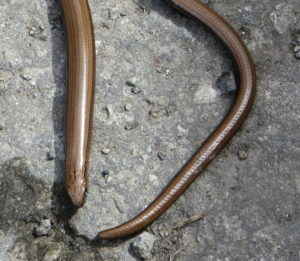 Its relatives lived when dinosaurs roamed the earth. 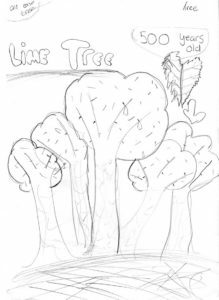 And then it was ever onward before stopping to discuss whether if you cut a tree down it grows back again and then into the depths of the wood to discover a tree that was about 500 years old – a small-leaved lime tree.